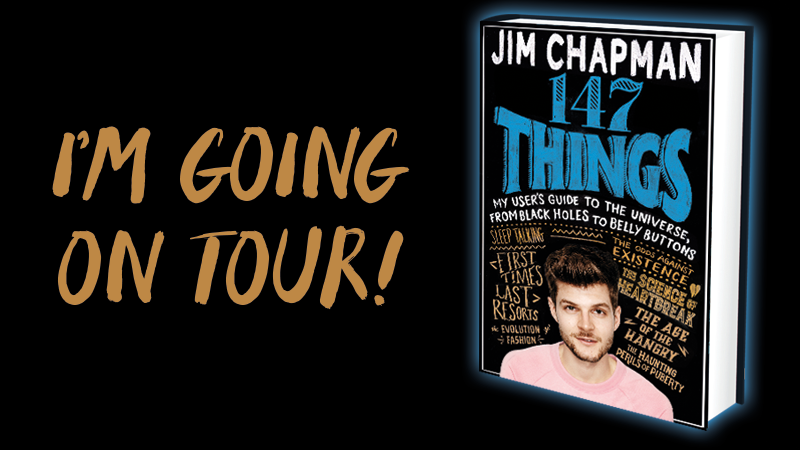 Jim Chapman will be touring the UK this September and October, stopping off to sign copies of his book 147 Things in London, Manchester, Glasgow and more. Jim Chapman will be touring the UK this September and October, stopping off to sign copies of his book 147 Things in London, Manchester and more. Jim will be signing copies, talking to fans and posing for photos, and we'll have exclusive treats for those who get down early! All ticket prices include your signed copy of 147 Things, and if you're bringing along a parent or guardian they'll be able to get in for free. Coming along? Shout about it on social media using #147Things - see you there! Jim chats to Emma Gannon about 147 Things. No subject is off-limits! In 147 Things, Jim takes us on a whistle-stop tour of the best bits of everything, from the mind-blowing to the ridiculous. As with his videos, no subject is off-limits and he’ll lift the lid on his life and his relationships, sharing embarrassing stories and things he’s learnt along the way. If you’ve ever felt weirded out by the fact we’re seven billion (mostly) hairless apes spinning around a giant ball of flaming gas, or that we all begin as tiny humans INSIDE our mothers, or that many of us keep slightly-less-dangerous wolves in our homes, then you need this book in your life. Jim wants to inspire you with the sheer unlikelihood of us all being here and equip you to feel just a little less overwhelmed by the small stuff.